Three Summer Olympic Games and two Winter Olympic Games have been canceled since Athens hosted the inaugural games of the modern Olympiad in 1896. 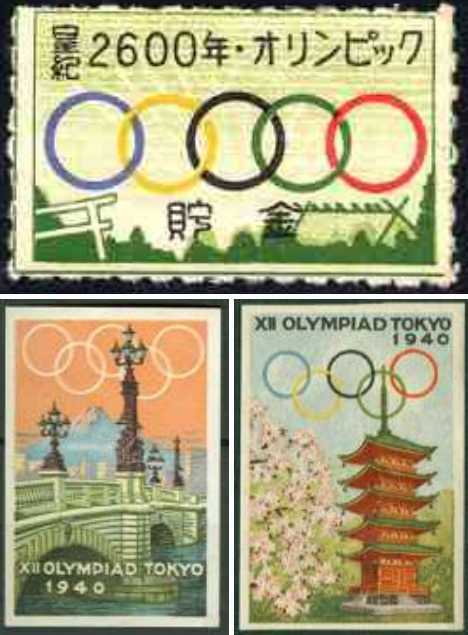 Few visual records of these “lost Olympics” exist besides prototypical promotional and/or postal artwork. The nostalgic glimpses of alternative Olympic history presented here were designed to glorify Mankind’s competitive spirit in a utopian world untainted by war. The International Olympic Committee‘s official records system is based on the concept of an “Olympiad” – an Olympic Year, as it were. Once that year has passed and regardless if any Games were held, the next Olympiad is denoted by applying the next consecutive Roman numeral. 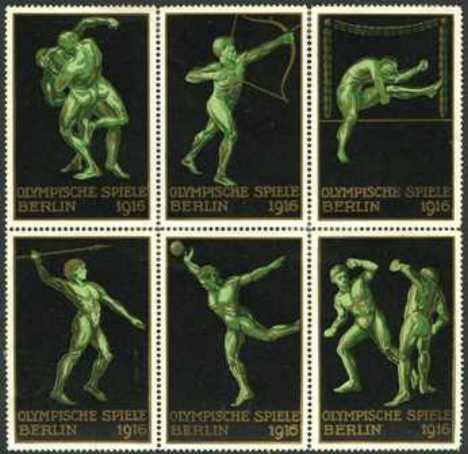 Thus the 1912 Games of the V Olympiad held in Stockholm, Sweden, were followed by the 1920 Games of the VII Olympiad held in Antwerp, Belgium. 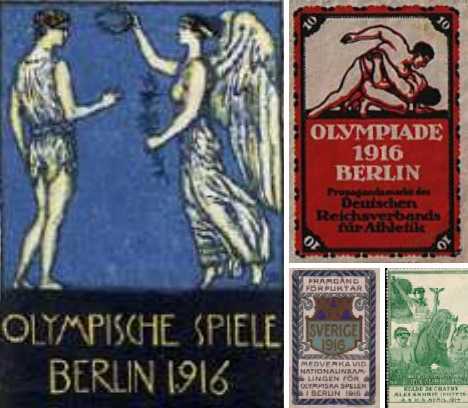 The Games of the VI Olympiad, scheduled to be held in Berlin, Germany, never took place after being officially canceled shortly after World War I began in the summer of 1914. 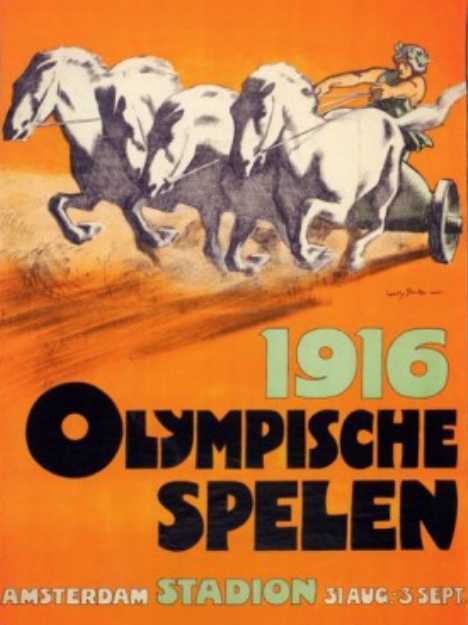 Planning began on the 1916 Olympic Games almost immediately after Berlin was selected as the host city during the 14th IOC Session in Stockholm. Among other cities that applied to host the Games were Alexandria, Amsterdam, Brussels, Budapest and Cleveland. The 64,000-seat Deutsches Stadion, or “German Stadium”, was built over the course of one year and was officially dedicated on June 8th of 1913 – it was closed in 1934 and the Berlin Olympiastadion was built on the site. 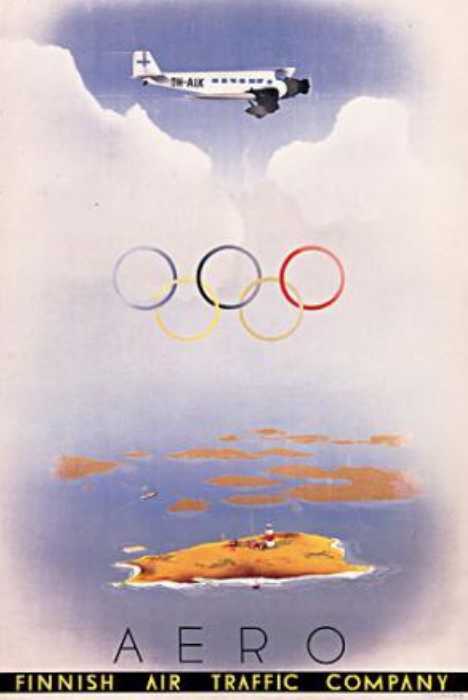 Posters, travel brochures and postage stamps were designed with very little material seeing the light of day due to the Games being canceled two years before they were to begin. 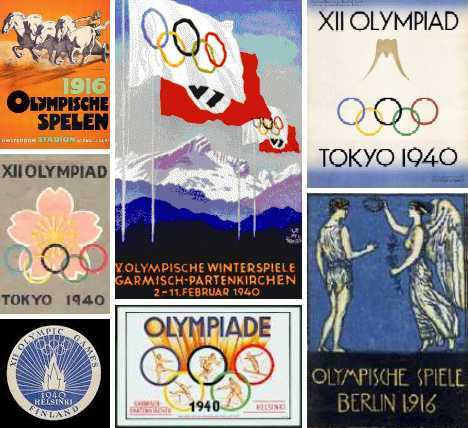 It may seem odd that the Summer and Winter Olympic Games were awarded to both Germany and Japan amidst the obvious increase of militaristic policies espoused by these nations’ governments in the 1930s. Then again, the Olympic Movement has always striven to keep athletics and politics separate. The 1940 Summer Games were scheduled to be held in Tokyo from July 20th to August 4th of 1940, with the Olympic flame to be flown non-stop from Germany via a never-before-flown Messerschmitt Me 261 airplane. 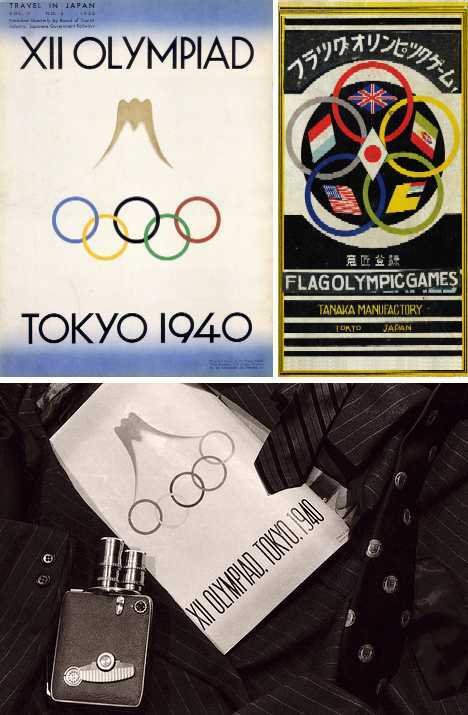 The government of Imperial Japan never really got behind the 1940 Tokyo Olympics as Japan’s leaders fundamentally disagreed with the Games’ peaceful precepts and concepts… not to mention they had other, more pressing concerns. 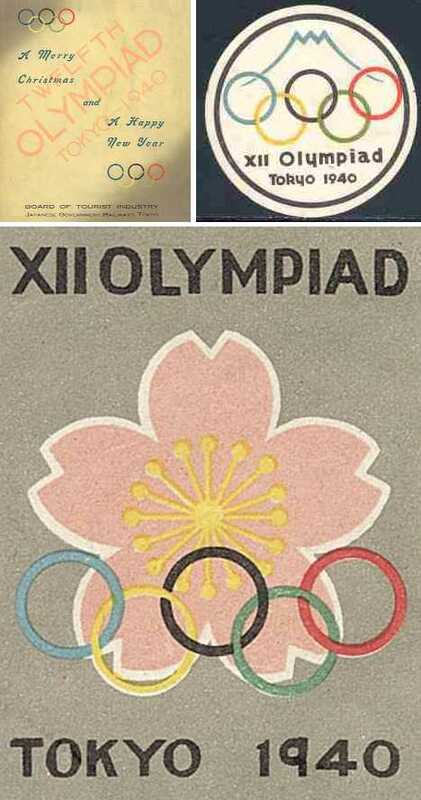 By 1938 the Second Sino-Japanese War was raging and both Japan and the IOC seemed eager to find some excuse to abandon the 1940 Games. Things came to a head in July of 1938 when the government of Japan officially withdrew their support. 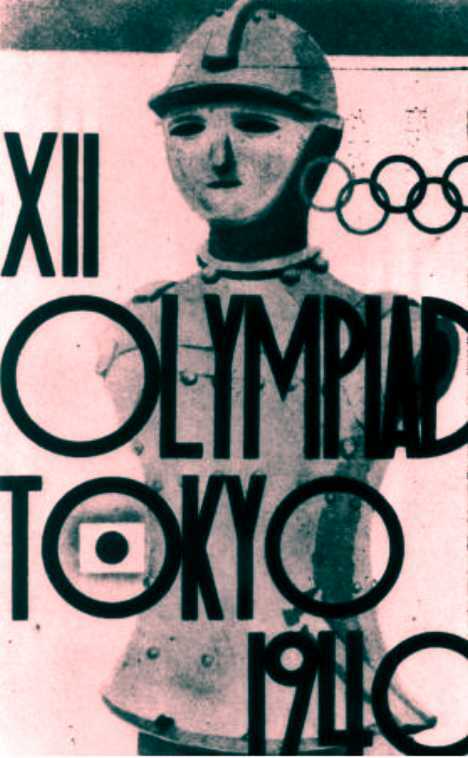 Though the 1940 Tokyo Olympics were still two years away, much preparatory work had been done in anticipation of the first Olympic Games held in Asia. The images shown here include both official and unofficial efforts to paint a positive picture of the host country though the stylized, helmet-wearing soldier in one poster may have undermined efforts somewhat. With little time to spare, the IOC scrambled to find a new host city and settled on Helsinki, Finland, which was the runner-up to Tokyo in the original bidding process. Helsinki was reasonably prepared to shoulder the burden of hosting a Summer Olympics having completed the Helsinki Olympic Stadium in 1938. The 1940 Olympics were to see the debut of a new Olympic sport: gliding. War clouds were gathering over Helsinki as well, however, and the outbreak of World War II in September of 1939 prompted the IOC to cancel the 1940 Helsinki Olympics. Just as well… on November 30th, 1939, the USSR declared war on Finland and Soviet bombers appeared over Helsinki. Finland would manage to hold off the Red Army in several wars outside World War II’s main theaters and Helsinki’s Olympic Stadium survived relatively unscathed. 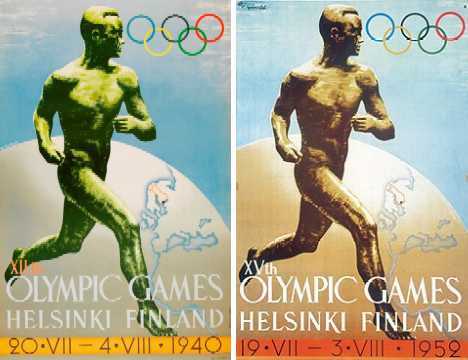 It was to be the centerpiece of the 1952 Summer Olympic Games which had the character of a postponement – even some of the promotional material from the lost 1940 Helsinki Olympics was revised and reused 12 years later. Sharp-eyes are required to note one salient difference between the two Ilmari Sysimetsä-designed posters above: the outline of Finland in the 1952 poster is slightly smaller than on the original poster as the country lost territory to the USSR with the signing of the Moscow Peace Treaty in 1940. A similar situation occurred regarding the 1940 Winter Olympics originally scheduled to be held in Sapporo, on Japan’s northern island of Hokkaido. 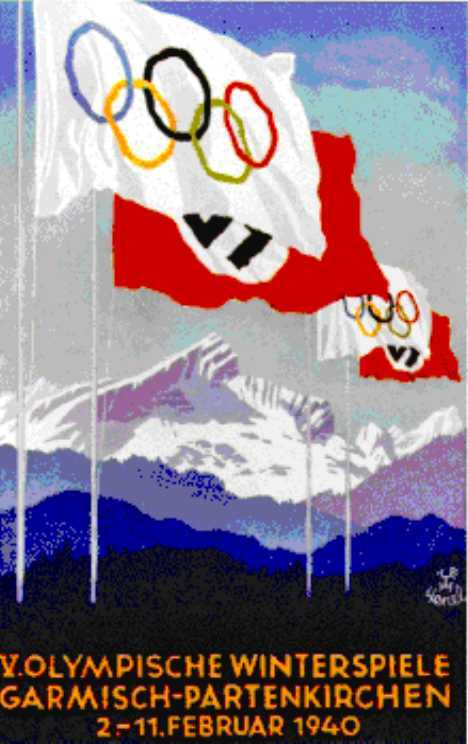 The IOC first offered the Games to St. Moritz, Switzerland, but conflicts with the Swiss town’s organizing committee over the eligibility of professional ski instructors saw the IOC offer the games to Garmisch-Partenkirchen, Germany, where they had been held in 1936. 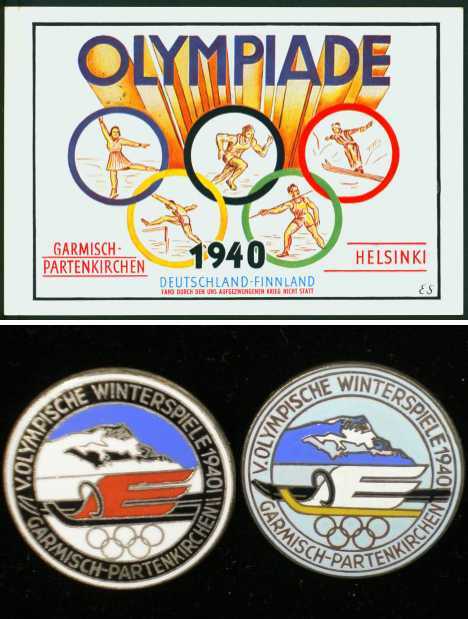 A limited amount of promotional artwork was created in the very short time frame between June 1939 when the Games were awarded to Garmisch-Partenkirchen and November 1939 when Germany (and not the IOC) withdrew their official invitation. “Lucky 13” strikes again? Never have an Olympic Games been as DOA as the 1944 London Olympics and their cold-season counterpart, the VI Olympic Winter Games awarded to Cortina-D’Ampezzo, Italy. 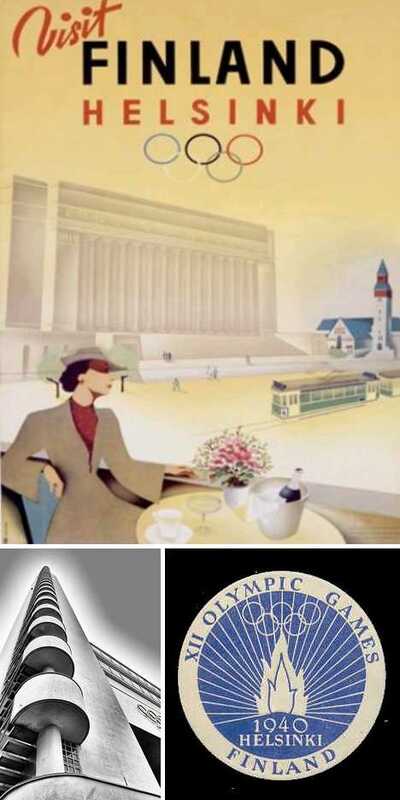 The official IOC election for the 1944 Summer Olympic Games’ host city took place in June of 1939, in London, England. The defeated applicants (in order of votes) were Rome, Detroit, Lausanne, Athens, Budapest, Helsinki and Montreal. 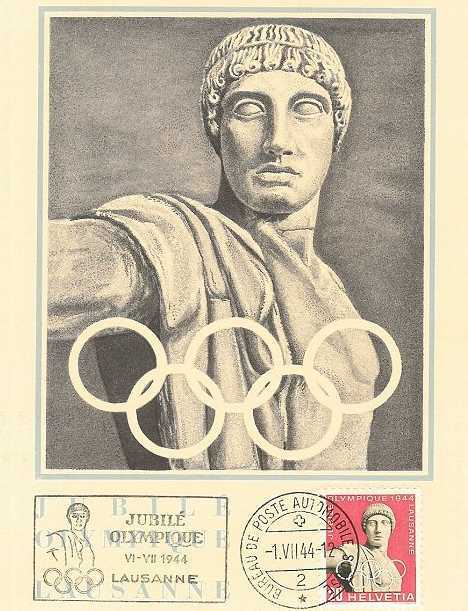 The year 1944 happened to mark the 50th anniversary of the IOC’s founding, however, and Switzerland issued a series of stamps commemorating the event. 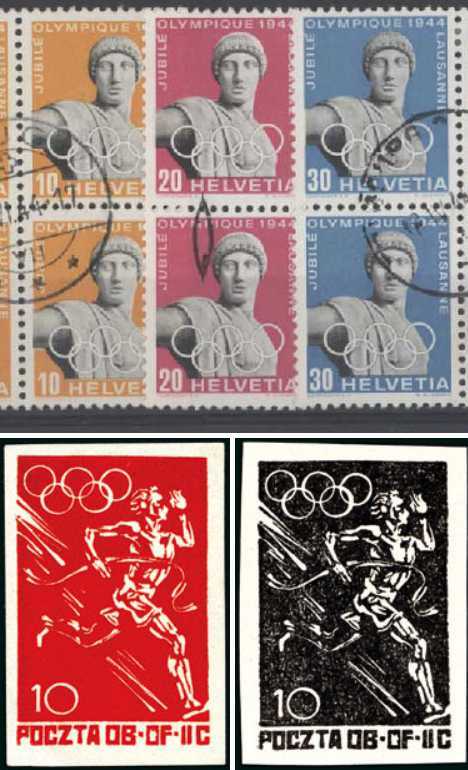 The stamps are display the name of Lausanne, the Swiss town where the IOC’s headquarters is located. 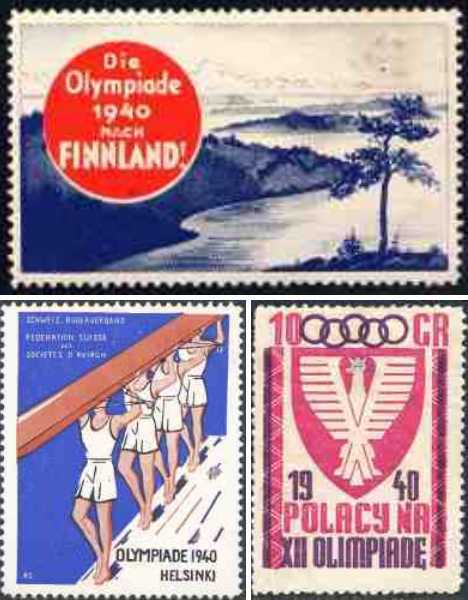 Other stamps marking the never-held 1944 Olympics were handmade by Polish prisoners at the Woldenberg POW camp after being granted permission by their German captors. Surprisingly enough, modern-day designers haven’t completely forgotten the so-called “forgotten Games of 1944”. 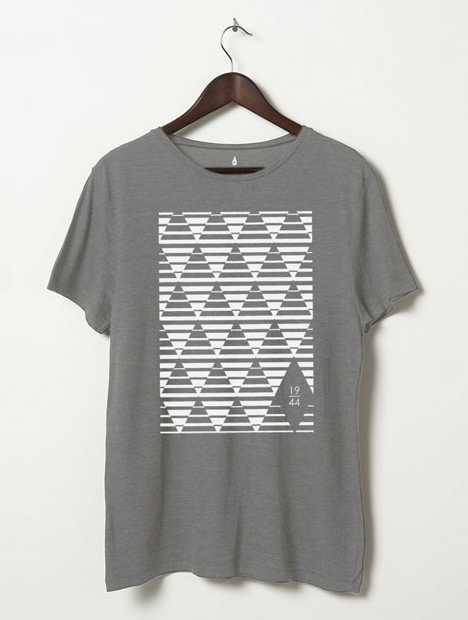 Topman has released a new line of A.D shirts displaying graphics influenced by the stillborn 1944 London Olympics. The graphics offer an intriguing look at what might have been though it’s much more likely the ’44 Games would have been much like the post-war Summer Olympics hosted by London four years later. 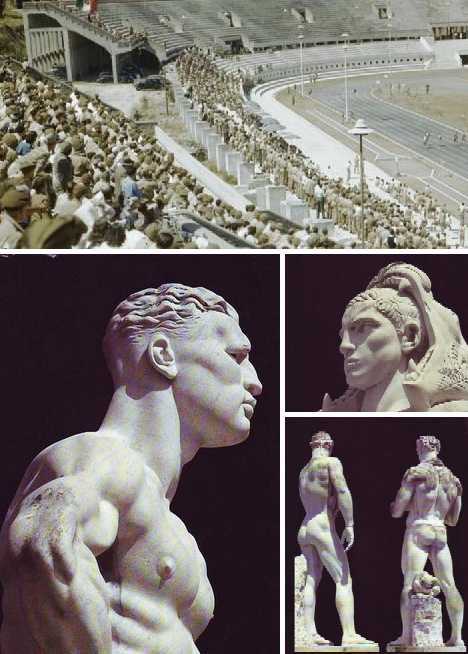 Italian dictator Benito Mussolini had already placed his bets on Rome winning the 1944 Summer Games, and had commissioned several pieces of statuary (above) to be placed in the “The Mussolini Forum”. As for Cortina-D’Ampezzo, the IOC continued its practice of postponing instead of canceling: the Italian alpine town graciously and successfully hosted the VII Olympic Winter Games in 1956. Lost in any discussion of the Lost Olympic Games are the crushed hopes of the athletes, many of whom trained for years leading up to a promised moment of glory. Four years is a long time in the life of an athlete; eight years can be a lifetime. 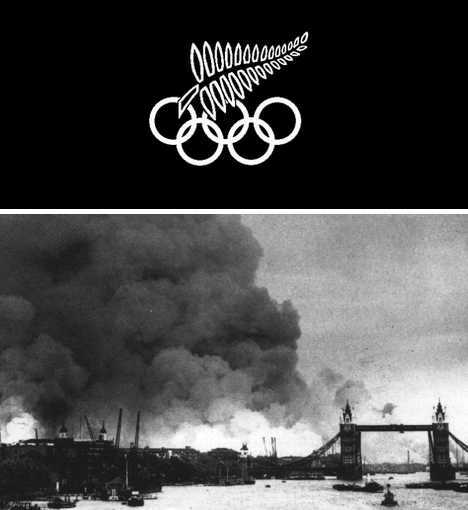 Five canceled Olympic Games (and several boycotts) are more than enough – and that goes for the catastrophic global events which led to their cancellation.